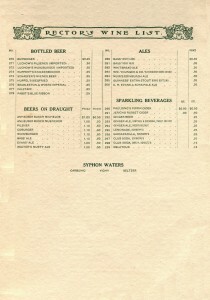 (Image courtesy The Henry Voigt Collection of American Menus). Above is a page from a circa-1900 wine list of Rector’s, a storied restaurant in New York in the early 1900’s. I spotted it when reading Henry Voigt’s masterful blog entry here on the history of the Rector’s establishments. In an earlier blog entry, I discussed lager and ale in their current signification. In this “redux”, I go back 110 years to point up the different terminology these terms then had in America. That meaning was well-established intramurally in breweries in the later 1800’s, but the menu is an early illustration that the same understanding was being gained by the public generally. This is not to say that beer didn’t always, in North America, connote any form of malt beverage, but in brewers’, retailers’, and restaurant and bar circles a particular meaning became established as the 20th century gained pace. “Beer” meant lager beer, which at the time could be dark or light, and in its American form generally used rice, corn or some type of sugar addition to bulk out the malted barley base. Ale meant what it does today, but also comprised porter and stout. 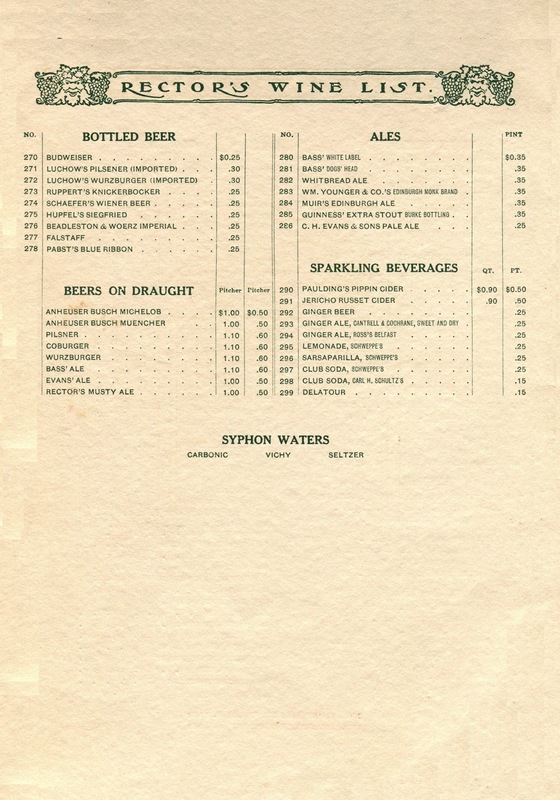 Bracketing ale with porter and stout was not correct in historical terms but for a long time in America, anything that wasn’t beer was ale, and Rector’s menu shows this by including Guinness Stout in the ale category. Lager, which in German means something stored (think of “locker”), is fermented at cold temperatures with single-cell lager yeast. The American form, as well as say Labatt Blue in Canada or Molson Canadian, all derive from the lagers which German and Bohemian brewers commercialized industrially from the mid-1800’s. These in turn were inspired by the beers which, for hundreds of years, brewers in Alpine areas had stored in cold mountain caves to preserve from winter to summer. Traditionally, brewing had to cease in later spring since warm weather would render the new brews highly unstable. Brewers in areas where natural cold was available stored the winter brews into the summer and perceived the yeast sank slowly to the bottom of the vats. This yeast acquired the characteristics which assisted the cold fermentation and preservation of the next brew, and so on. In general, lager was cleaner and rounder than ale. With the benefit of mechanical refrigeration and better science in the 1800’s, brewers in the German lands developed methodically the same kind of lager beer. Initially most lager was dark but later the blonder style associated with the first Pilsener lager, Pilsner Urquell (1842), became the standard for international lager beer. “Ale”, in contrast, pre-dated all these forms. It is a beer fermented at ambient or at least warmer temperatures than lager and the yeast tended to gather at the top of the brew before it was skimmed off. Ale in general had a more fruity taste than lager and sometimes a tart one. Some Belgian beers to this day retain that old sour edge, and indeed have inspired the current craft fashion for “sours”, but in general people didn’t want it: clean, round-tasting lager took up the part of the market ale couldn’t satisfy. Thus, all beer was ale originally – top-fermented at warm temperature – including on the Continent. But lager took over almost everywhere and finally even in the United Kingdom, where nonetheless top-fermented beers refused to die and enjoy a minority share of the market today. Indeed those beers largely formed the inspiration for the craft brewing revival in North America. English and other British settlers in America, as well as early Dutch incomers to New York, brought this older, top-fermentation tradition. It held sway until German immigrant brewers started to implant the taste for lager. Still, in 1900 and even at the dawn of the craft brewing revival in the 1970’s, ale in North America had never quite left the scene. Certainly many characterful ales were still being made in America, not just the U.K., when Rector’s was going strong, including the ale from C. H. Evans mentioned on the menu. Evans was a Hudson Valley concern which followed the old English ways, as appears from this excellent short history. In menus I have seen from before 1900, beers are generally included in one group without any attempt to classify them by style. This practice held on for the draft section of the Rector’s menu: ales and beers are combined under the one heading of beer. But Rector’s innovated by showing the kind of distinction we now take for granted for its premium bottled beer selection. (It may be too that draft was itself regarded as a kind of category apart). Thus remained the schema until about 30 years ago. Starting then, the previous opinion that beer was lager and the other kinds of malt beverage were ale, started to die. (For simplicity, I’ll leave out the special case of Colt 45 and other “malt liquor”). Today, it is all “beer” and sub-classifications, which are often very learned, abound such as BJCP’s. Arguments continue of course whether these classifications are correct. These debates are likely never to end since taste is subjective and brewing technology constantly evolves, which are the main factors impinging on any classification system. But in 1900 anyway, Rector’s took care, with some novelty in my view, to set out a brewer’s and wholesalers’ distinction for its chic clientele. Certainly, the enviably large beer selection would have been a draw for any beer buff, well-classified or not. But as Henry has shown so well in his piece, Rector’s was initially a society haunt and later attracted other crowds, from parvenus to show people to pre-Jazz Age hot dancers. None of these were probably students of beer, shall we say. The carefully drawn beer menu probably elicited few second thoughts. But across the ages, we can open what Stan Hieronymus has referred to as a time capsule, and apply our knowledge to understand the significance of what Rector’s was doing. Meet The Old Boss, Same As The New Boss, Cont’d.